The first philosophers of the Frankfurt School famously turned to the psychoanalytic theories of Sigmund Freud to supplement their Marxist analyses of ideological subjectification. Since the collapse of their proposed "marriage of Marx and Freud," psychology and social theory have grown increasingly apart to the impoverishment of both. Returning to this unholy union, Benjamin Y. Fong reconstructs the psychoanalytic "foundation stone" of critical theory in the effort to once again think together the possibility of psychic and social transformation. Drawing on the work of Hans Loewald and Jacques Lacan, Fong complicates the famous antagonism between Eros and the death drive, which undergirds the Freudian concepts once appropriated by the critical theorists, in reference to a third term: the woefully undertheorized drive to mastery. Rejuvenating Freudian metapsychology through the lens of this pivotal concept, he then provides fresh perspective on Theodor Adorno, Max Horkheimer, and Herbert Marcuse's understandings of psychic life under the influence of modern cultural and technological change. The result is a novel vision of critical theory that rearticulates the nature of subjection in late capitalism and rejuvenates an old project of resistance. Benjamin Fong offers the most cogent and compelling case I've encountered in defense of the death drive, showing that it should not be equated with violence and destruction but, to the contrary, seen as a means for individuation and life. At various moments in Death and Mastery, the writing is so down to earth as to make the reader smile: it is wonderful to see academic ideas expressed so matter-of-factly, without the usual rhetorical acrobatics. 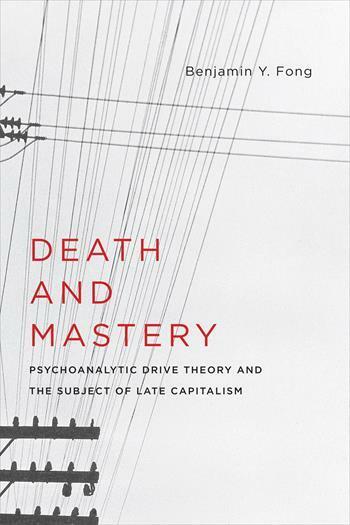 In this masterful and enlivening study of the ways in which the concepts of death and mastery have been elaborated in Freudian and post-Freudian social theory, Ben Fong has given us the means to think about human nature and human community now, under conditions of advanced capitalism, without succumbing to the scientism of the new neurobiology or to the social constructivism of recent historicist social and cultural theory. The argument turns on the ambiguity embedded in the notion of mastery: on the one hand, the capacity to engage creatively with the world, to master the tasks of living a historical form of life; on the other, the temptation to enslave, to compel others to exercise this competence in one's place. Fong is able to analyze with remarkable lucidity a complex array of individual and social phenomena by fleshing out the imbrications of these twinned responses to what Freud called the drives' demand for work. Fong makes abundantly clear that drive theory and social theory are strongest when thought together. To the vexed question of the relationship of psychoanalysis to social theory Benjamin Fong brings a distinctive sensibility and tact. Avoiding the portentousness and unduly ambitious abstraction of this now overspecialized field, Fong has made the whole subject both newly intriguing, and wholly engaging. Benjamin Y. Fong is a Harper-Schmidt Fellow at the University of Chicago. His work has been published in Psychoanalysis, Culture & Society, the Journal of the American Academy of Religion, and the New York Times' philosophy blog, The Stone.